As a child growing up in an Italian American household, roasted chestnuts were always a big part of the Thanksgiving and Christmas feasts. I have always loved them and am now exploring other ways in which they can be enjoyed. Back before the turn of the twentieth century, American Chestnut trees made up one quarter of all of the hardwood trees covering an area of the Northeastern United States estimated at being as large as 200 million acres. Beginning around 1904, a fungus known as Cryphonectria parasitica (formerly Endothia parasitica), reached the United States from an imported Asian chestnut tree and subsequently brought about a chestnut blight that decimated the American chestnut tree population. Growth and distribution of American Chestnuts has still not bounced back since the blight of the early 20th century. Americans looking to add chestnuts to their holiday menus are most likely buying European chestnuts that come from Southern Italy, Portugal , or France (FYI-these chestnuts are actually of West Asian origins). 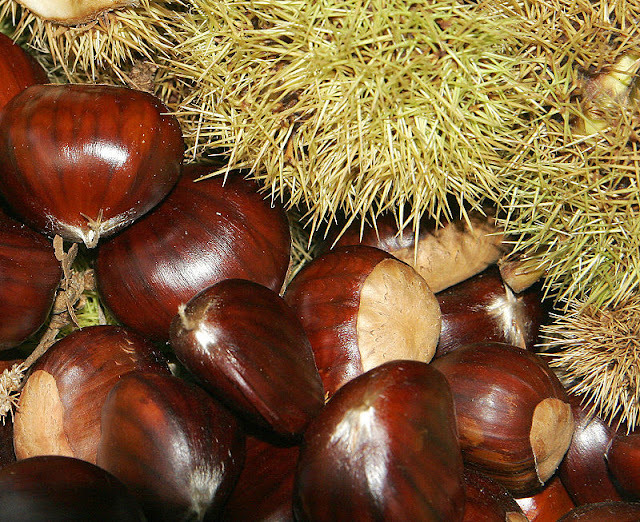 Historic recipes for chestnuts certainly do reach far back in time. American Indians used them in stews. The ancient Romans used chestnut flour in recipes and cooked them with lentils; the French use chestnuts to make Marrons Glaces (candied chestnuts) and a chestnut puree as a crepe filling; the Italians use them in cakes among many other recipes; and the Austrians use them to make the famous Nesselrode Pudding, a frozen moulded chestnut ice cream. This is just a small slice of the many other ways to enjoy chestnuts. Here are two spiced and fun ways to present chestnuts at your holiday table, or anytime! While I love the idea of making candied chestnuts, the Marrons Glaces I had in France seem a bit too sweet for me. I decided to make a recipe that resembles the idea of candied chestnuts without the overpowering sweetness. I've also added a bit of spices to make it more flavorful for the festive holiday season. Place the sugar, water, vanilla, and spices in a medium sauce pan and place over medium-high heat. Bring to a boil. Add the chestnuts to the sauce pan and bring back to the boil. Boil for just about 2-3 minutes and then remove from the heat. Let the chestnuts cool in the spiced syrup, about 1 hour. For extra sweet chestnuts, store the nuts in the syrup in a jar in the refrigerator. If you want less sweet chestnuts, drain the syrup and store the chestnuts in a sealed plastic container in the refrigerator. The Boston Cooking School Cook Book by Fannie Merritt Farmer. Boston, 1896. Add the chestnuts to the spiced oil and mix until all of the chestnuts are coated evenly. Lay the chestnuts on the parchment-lined baking sheet. Place in the heated oven and bake for 15-20 minutes. Remove from the oven and cool for 5 minutes, or until cool enough to touch. Sprinkle with salt to taste.